Top this Roasted Spaghetti Squash with your homemade pasta sauce or chili for a delicious and healthy dinner. It makes a nice low carb alternative to pasta! Lately, I’ve been making Roasted Spaghetti Squash to serve with my homemade meat sauce instead of gluten-free pasta. 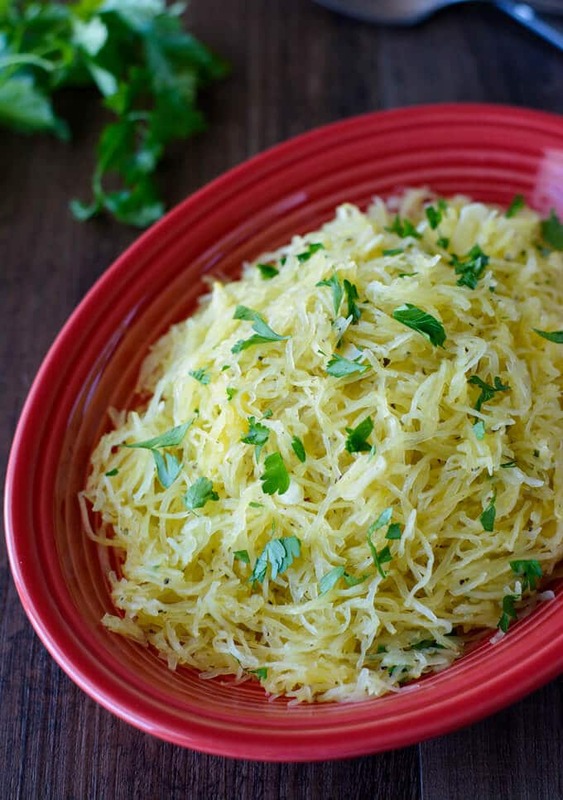 While I LOVE my pasta, this spaghetti squash makes a tasty substitute! When cooked properly, it has a nice al dente texture. Kind of like angel hair pasta, but with way fewer carbs. I’ve cooked spaghetti squash multiple ways over the years and never been wowed with the results. 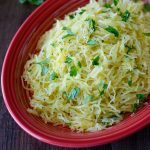 I finally found a method that yields perfect strands of spaghetti squash every time. Line a rimmed baking sheet with foil. Place the spaghetti squash, cut side up, on the baking sheet. Brush some oil all over the flesh of the squash. Season with salt and pepper. Place into a preheated oven and roast until the insides of the squash are tender and can be easily raked with a fork. It should have the texture of al dente pasta. This is a method that I picked up from Ina Garten’s, Cooking for Jeffrey cookbook. I didn’t follow her exact recipe from the book, just the method. Ina also had a tip for cutting spaghetti squash in half which made it a bit easier to cut. Slice a little bit off the bottom with a large chef’s knife to create a more stable surface. Stand the squash upright. Stick the tip of your knife into the top of the squash just below the stem. Carefully, make a straight cut down the middle of the squash from top to bottom. Rotate the squash and slice straight down the other side from top to bottom. Break the squash open with your hands. 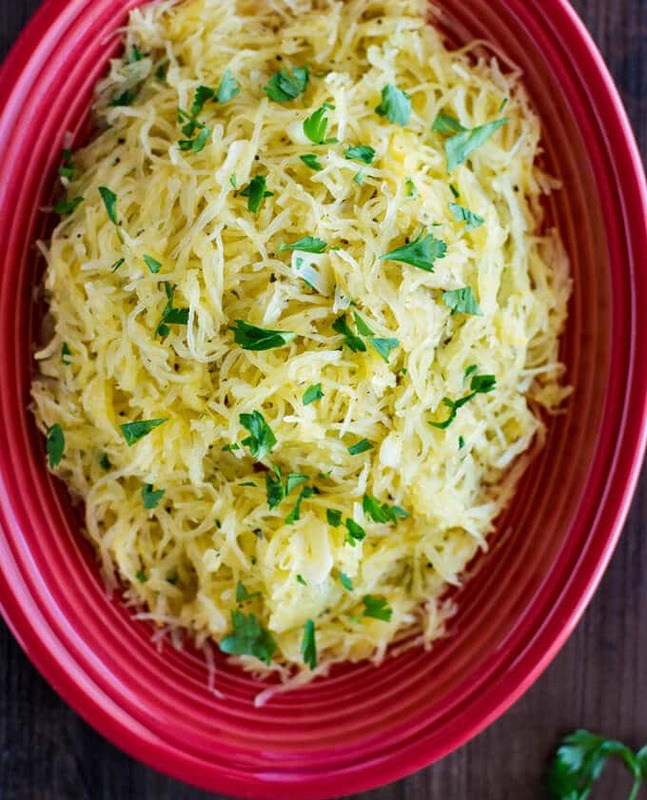 Roast and shred the spaghetti squash into a bowl. Cover and refrigerate. When ready to serve, sauté the garlic, add the squash to the skillet and finish out the recipe. Top this Roasted Spaghetti Squash with your favorite pasta sauce or chili for a delicious and healthy dinner. Line a rimmed baking sheet with foil. Place the spaghetti squash, cut side up, on the baking sheet. Brush the melted ghee or olive oil all over the flesh of the squash. Season with salt and pepper. Place into oven and roast until the insides of the squash are tender and can be easily raked with a fork, about 45-50 minutes. It should have the texture of al dente pasta. Let cool until you can handle it. Using a fork, shred the flesh into spaghetti-like strands and place into a bowl. In a large skillet with high sides, heat 2 tablespoons of ghee over medium heat. Add the garlic and cook until fragrant, about a minute. Do not let burn. Quickly add the shredded squash to the skillet and sauté, stirring occasionally, until heated through, about 5 minutes. Add the Italian seasoning, season with salt and pepper to taste. Off heat, add the parsley and parmesan cheese, if using. Serve as a side dish or topped with your favorite pasta sauce or chili. Make ahead option Roast and shred the spaghetti squash into a bowl. Cover and refrigerate. When ready to serve, sauté the garlic, add the squash to the skillet and finish out the recipe.